Why is giving feedback so stressful for some managers and employers? For starters, it’s a form of public speaking, and face to face engagement, especially when delivering criticism, is not everyone’s strong suit. Secondly, having that amount of power over someone’s emotional state and self-perception as an employee is a lot to handle. While some managers revel in it, others may find it disconcerting to have that much control over the way that they might make someone feel, especially an employee they like. Perhaps it’s uncomfortable because you didn’t spend enough time preparing for the review, perhaps you once had a bad experience of your own and feel turned off by the process altogether, or perhaps you have a fear of being viewed negatively by your employees. In a study conducted by Dr. Carla Jeffries and Matthew Hornsey they discovered that failure to offer constructive feedback may in fact be more about protecting ourselves than about protecting others. Fear of being disliked and the fear of needing to confront our own shortcomings by pointing out those of others make the feedback process inherently uncomfortable. The truth is that feedback is a requisite in all businesses. It is key to employee progression, which in turn affects the progress of the company at large. Without feedback prompting improvement, how can we grow? In a past feedback session with a former boss, I saw my otherwise confident employer unravel. We had a nice relationship, had even grabbed a beer a few times after work, but this ultimately led her to tiptoe around what she really wanted to say. Her words came out wrapped in niceties and I was forced to try to read between the lines of this very vague and very unproductive review. I left more confused than I went in. What she didn’t know, and what all employers need to know, is that we want the feedback, all of it. 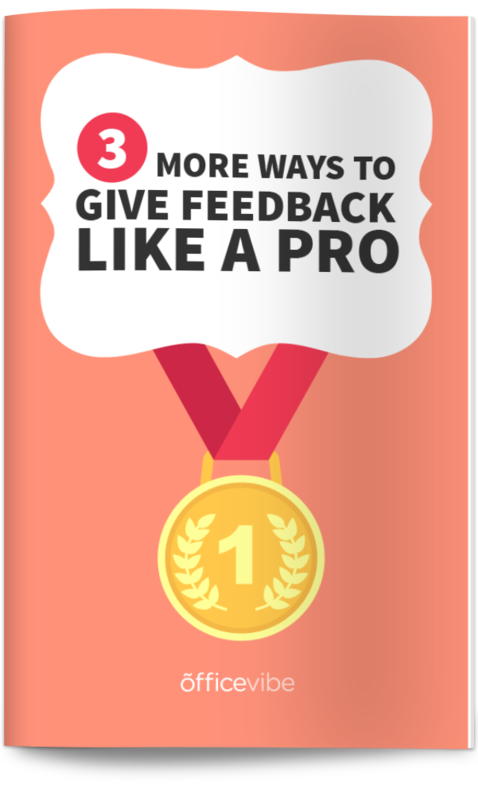 Download this right now: 3 more tips to better feedback that your employees will appreciate. The concept of confrontation has long held a negative connotation. When we think of needing to confront someone words that come to mind might include argument, aggression conflict and fight. On the other hand, the idea of confronting, conquering and overcoming our issue has a more positive spin, though, the thought of stepping into a feedback session to confront our deficiencies and weaknesses is still destabilizing both for the giver and receiver of feedback. That’s why in his recent article, The Ten Commandments of Confrontation, John Maxwell suggests first revising the way we perceive the situation. Don’t consider it confrontation, consider it clarification. Instead of seeing your mission as confronting an individual, think of it as clarifying the team’s needs. This doesn’t mean coddling the person, or minimizing the issue at hand. But a positive perspective on the conversation will make the whole task less daunting for you. People strive to be the best version of themselves in their career, hoping to grow out of their current role and move up. That doesn’t happen by false praise or an undeserved pat on the back for the sake of keeping things tidy and amicable. Having someone to guide them with constructive feedback is often considered a privilege. Go into this with the mindset that you are not a villain, you are a teacher. Negative (redirecting) feedback, if delivered appropriately, is effective at improving performance. It is not only about what we say, but how we say it that matters. When you earn the respect of your employees there is a greater likelihood that they will listen to your feedback. asked a global sample of 3,875 people who’d received negative or redirecting feedback if they were surprised or had not known already about the problem that was raised. We were taken aback to discover that fully 74% indicated that they had known and were not surprised. Knowing in advance that your news and criticism will not be shocking should be comforting, allowing you to focus instead on a respectful, concise and productive delivery. Much like you prepared cue cards in high school for your oral presentations, it’s important to go into feedback sessions with the same organization. Make a list of key points you’d like to cover and bring some of your employee’s work that you would like to refer to as concrete examples. This will help keep things flowing, and, showing that you put in the time and energy says “you are worth it and you matter,” which will be appreciated by the receiver. It’s also important to not only come prepared with specific examples of the employee’s shortcomings, but examples of the employee’s positive contributions. Delivering good news will help balance the tension in the review, will give your employee a boost and will act as a standard of quality from which they can refer for their forthcoming work. To avoid making things personal, reference specific behaviours instead of character traits. Say things like “It would be great if you can take more initiative by staying a bit later during production cycles. We would appreciate the extra hand and your additional insight.” instead of, “You are lazy and unhelpful during production cycles”. Zooming in on actions instead of your employee’s characteristics and values keeps the conversation relevant to the workplace environment and away from what can otherwise be perceived as “name calling”. It is also essential to focus on behaviors instead of personal attributes as while behaviors can be changed, our traits are often less flexible. Don’t set your employees up for failure by asking them to alter their character type. Pointing out issues and leaving it at that is useless. Offering solutions will motivate your employee, offering two solutions will expedite this motivation, and you will leave the meeting not having only outlined the negative but having paved a path for something positive to come. Humble yourself by offering your employee the floor. Part of the feedback process should be receiving it as well. Ask them how they felt about the process, if they have any questions, and whether they have any advice to offer you as a leader for the next round of feedback. Making yourself vulnerable will help you earn the respect of your employee, and promotes a culture of continuous learning and improvement. Giving them their voice back after what at times can be a difficult moment will help stabilize the tension in the room. Sharing the power lets your employee know that you see them as a valuable member of the team. Allowing the employee to contribute to the feedback process and offer solutions will help them accept the feedback more readily. Employees should discuss their personal problems, express their personal feelings, recognize their own performance shortcomings and discuss their job performance objectively during the feedback process. Any Tips On How You’d Get More Comfortable Giving Feedback?